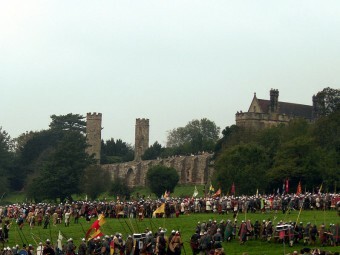 The Battle of Hastings, like so many other battles, was a dispute over the line of succession to the English throne. But it ending up being much more than that – the Battle of Hastings, fought on this day in history, 1066, ushered in a new era in the English legal system, language and culture in general. It also planted the seed of the feudal system that would be the basis for English society for centuries to come. Edward, King of England was cousins with William, the Duke of Normandy. In 1066, when Edward died childless, the throne passed to an earl named Harold Godwinson. William insisted that Edward had promised the crown to him before his death, and had every intention of taking the throne and assuming his rights as Edward’s heir. Harold believed his claim to the throne was at least as good as the Duke’s, mainly based on his close relationship with Edward the Confessor and his wife. Unfortunately, Harold was forgetting that William also had the support of the nobles from Normandy – and Flanders and Brittany as well. On October 14, 1066, William ended any hopes Harold may have harbored of keeping the crown with one swift, military action on Seniac Hill that took less than ten hours to complete. Harold’s Saxon army was brutally and decisively cut down by William’s Norman forces. As to what happened to Harold exactly, legend has it that Harold met his end that day by being shot through the eye with an arrow. William left a trail of bloodied corpses, and then torched much of south and southeast England as a finishing touch. Naturally, this did not endear him to the native Anglo-Saxons he meant to rule. Nevertheless, William, now known as William the Conqueror, was crowned King at Westminster that Christmas. The Battles of Hastings is often referred as “the battle that changed history” due to the significant influence it had on the people of England and its culture. Many of these changes were not welcomed warmly by the Saxons, such as the stripping away many of their rights and privileges. Further, in earlier times, earls held significantly more power and authority, and the nobles in general enjoyed much more influence in matters of government. William changed this. Under his system, the king was the head honcho, and he pretty much kept anyone else from having any input into governmental goings-on. The Saxons didn’t like it, and staged a few poorly organized mini-rebellions, but these were easily squashed by the King’s forces. Culturally things began to change in England as well. Saxon practices spanning three hundred years were being replaced with Norman (French) customs, and even the language was changing to a French dialect. Eventually, the two tongues melded together to give birth to modern English. When William was still in Normandy, he had devised a centralized feudal system that he brought over to England. The system was based on the simple idea of offering one’s warriors an area of land, or a fief, in exchange for their loyalty. This system of offering land for loyalty is pretty much what kept a kingdom together at this point. In the case of William the Conqueror, he simply stole land from the native Anglo-Saxons and gave it to his Norman subjects for their service and loyalty. William I proved to be an effective king and when he died in 1087, his son William Rufus became the second Norman king of England was crowned as William II.